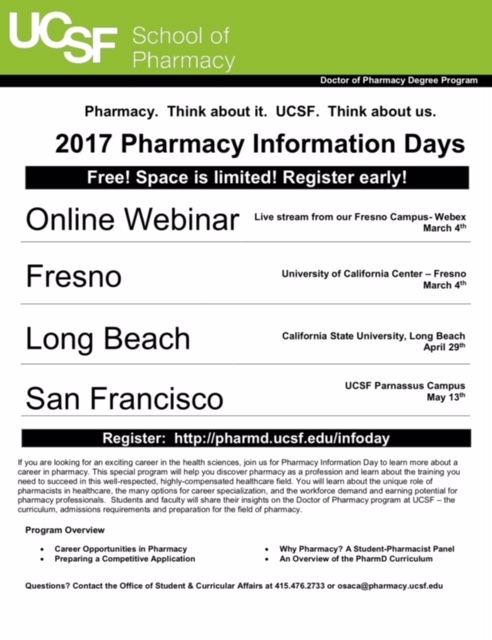 Reports From The Pharm: Pharmacy Info Days -- Coming At You - Spring 2017! 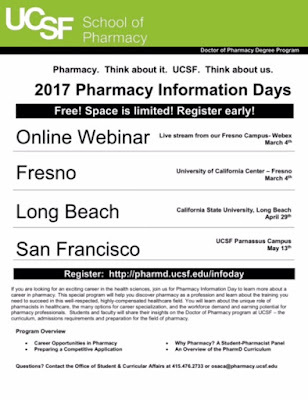 Pharmacy Info Days -- Coming At You - Spring 2017! It's that time of year again -- we go on the road to share important information about our PharmD program! This is particularly helpful for prospective students who are interested in learning more about our program as well as gaining a better understanding of what it takes to submit a competitive application. Although we'd love to meet you in person, we realize this is not possible for everyone -- particularly those located out-of-state. No worries. We now have an ON-LINE option. We will be streaming live from the Fresno location on March 4, 2017. Attendance is free for all four events -- but preregistration IS required. However, what these events ALSO provide are opportunities to meet with (and ask specific questions of) admissions representatives, current students, pharmacists, and other students who are also applying to pharmacy school. For more information and to register to attend, please visit our Pharmacy Information Day website.